I realize that I sidestep the issue all the time, dancing around, skirting the elephant in the room. It’s far easier to talk about the brindle boxer that is about to be euthanized than it is to talk about my father. Golly, how many times a week do I hear that question? It’s such a kind question, too, coming from a sincere concern for a man who touched so many lives. This road only goes in one direction, I want to tell them. He’s having more trouble with incontinence, I think to myself, but don’t say. That’s not the kind of thing one talks about in the lobby of the gym or the checkout of the grocery store. He needs help getting dressed. He’ll spend ten minutes scraping an empty bowl after lunch; he can’t stop himself from pursuing every last bit of soup that may remain. He spends hours at his dresser, rearranging his military insignia and lapel pins and tie bars. He has taken to sorting cards. 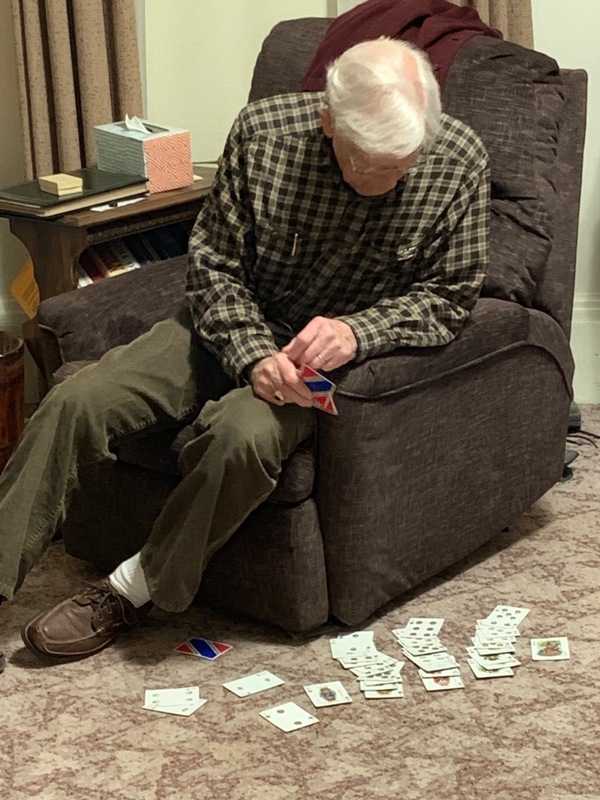 At first I thought he was playing Solitaire, but it’s actually a sorting exercise and I marvel at the way he pushes himself. He’ll have half a dozen books piled on the tray table next to his chair, but he’ll still scan the bookshelves and pull off another with that so-many-books-so-little-time mentality. Even though he can still read, I don’t think he gets the sense of what he’s reading. His favorite book to read: The Oxford Dictionary. But I know why he kept it all these years — and I’m not going to throw it away. Some things you hold onto, and clasp to your heart, even though they’re old and falling apart. And they pat me on the arm, or look knowingly at me, and smile. “Thanks for asking,” I say. It’s nice to know people care. It appears that he’s sorting by suit, and presumably by number?